If you're awesome enough to be my friend on FB then you already know what's been happening during the past week! If you don't already know, then get ready for a long (probably boring) update! Monday night I went to the Alabama basketball game with my cousin Anna Lisa. I had been having some back pain all day long but ignored it because I just assumed it was pregnancy related and everyone tells me that "pregnancy just hurts". I ended up leaving the game at half time, called Adam and told him I was going to the ER. They took me straight back (a perk of being knocked up, there were probably 50 people in the waiting room) and Adam finally made it when they were taking me back to a room. 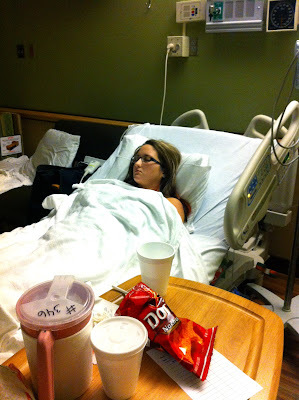 From the very beginning of all the pain that day I knew it was a kidney stone, I've had them before and trust me, you never forget what that feels like. The nurses took for-ev-er to come to my room which leads me to believe that they've never had a kidney stone before because they would've been in there sooner to give me some pain meds. 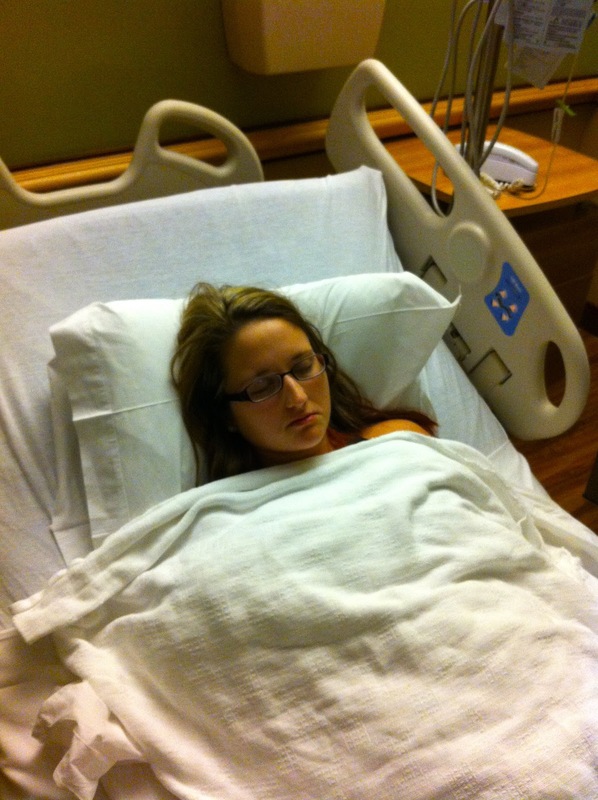 Finally, after a few hours, an ultrasound, and some much needed morphine the doctor came in and said it was 2 kidney stones. One which was still in my kidney, and the other that was out and moving. She gave me the option of going home with some pain medicine or I could be admitted and stay on IV meds. 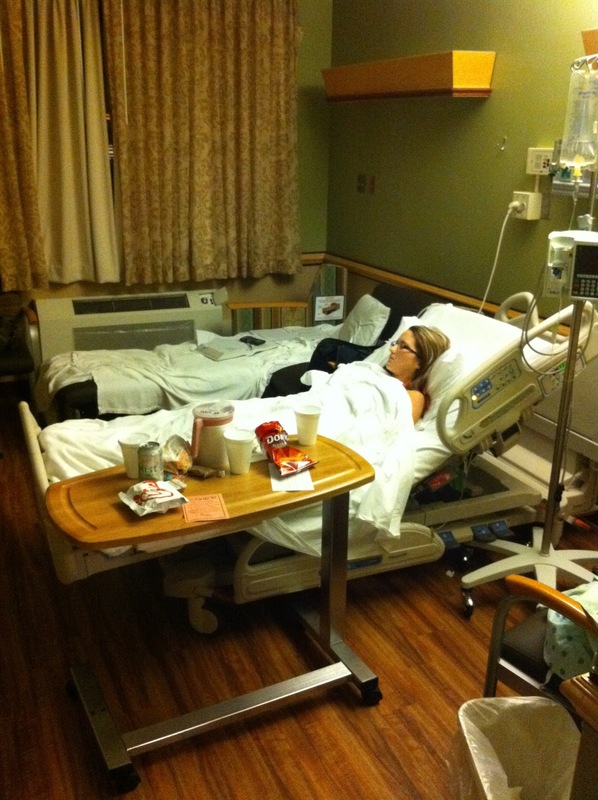 We chose to go home, I took some more medicine and went to bed. The next morning I woke up still in pain, but obviously I knew it would hurt to pass so I kept on ignoring it, still taking my medicine (which didn't harm Presley, I asked a billion times) but then got worried when I hadn't really felt her move all morning. I called my OB and told them what was going on and they told me that my Dr. wanted to see me just to check how things were. While all of this was going on the pain kept getting worse. Poor Adam had to deal with me crying like a baby, all. day. long. Dr. Ray wrote me another prescription for some Demerol and sent me home. She said if I start throwing up to call her and they will admit me to the hospital. Went home and BAM...started throwing up, what I believe was (and I may be over exaggerating), gallons and gallons of puke. During all of this my Mom was with me because Adam had a baseball game. My Mom called my Dr. and Adam and told them we were going to the hospital. Adam ended up leaving the game and met us there. I get admitted, moved up to Labor & Delivery where, conveniently there was only one nurse working on 4 patients. Blah, Blah, blah, so after more puking, one catheter, two IV attempts, and lots of Demerol later I was finally pain freeeeeeee! Thank ya Jesus! To make the long story short, it took 4 days (and 3 IV's) in the hospital for this sucker to finally stop hurting. I got discharged without passing the stone, but they say once it enters the bladder the pain stops and it will eventually pass. I don't remember the majority of it except the parts where my pain meds wore off and I was in the most pain I've ever been in...but thankfully I was knocked back out pretty soon once I called the nurse! I'm still having a little pain, I don't know if it's from the other stone that is in my kidney or what, but I am just taking Loratab when needed for that. Adam has been so super sweet to me during all of this. He slept on the most uncomfortable couch ever, got woken up with me every 20 minutes through out the night, and still went to class and baseball on little sleep (when he was gone my Mom was with me!). So to say that yesterday when I got to shower and sleep in my own bed was ah-may-zing, that's an understatement! 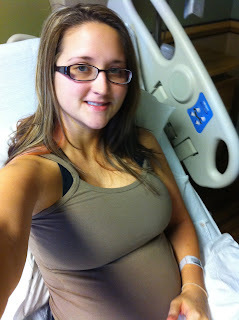 Hopefully I won't be back in the hospital until Presley get's here! If you made it to the end of this post, then brownie points for you!!!! during the visit to my OB we got this 4d picture of Presley! She's so cute! I looked at my phone when I got home and apparently Adam enjoyed taking pictures of his unconscious wife! Going home! Sorry, horrible picture, I'm super greasy ( I did shower at the hospital I promise), but so happy to be going home! I'm a new follower and I think your blog is too cute! Can't wait to read more. And you look adorable prego!